If one of your goals for 2015 is to take better care of yourself, we can help kick start your wellness program. This month’s feature treatment is designed to renew skin from the inside out. Reap the benefits of superfoods like spinach, maqui berry, chia seeds and carnosine with an antioxidant-rich, d-aging facial treatment that breathes new life into your skin. Head cradled in an ultra-comfy enVy pillow, bid farewell to dull, congested skin with a Longevity Facial that includes cleanse, tone, extractions, mask, massage and intensive exfoliation. Plus, peepers receive the added bonus of an anti-aging collagen eye treatment. 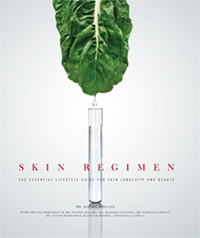 Skin is then nourished from the inside with a sampling of Ascenta Skin Supplement, rich in omega-3s, omega-6, plant-derived antioxidants and Vitamin D.
You’ll also receive the gift of a beautiful Skin Regimen Lifestyle Book – a $29 value FREE – to help you stay on track with a healthy lifestyle in 2015. This inspiring book is filled with amazing health and wellness facts, tips, recipes and more. Plus, you’ll receive a $10 credit towards your first consult with Raintree Holistic Nutritionist Laura Hillier. * Now that’s a renewed you!